1. The Teapot Mystery. We - Mr G, Molly and Me - went home for the night last Friday to take the Christmas decorations down (I'm of the belief that if left up after New Year Day its bad luck) and to take the overflowing bottle recycling bin out. The day before I had written the blog post about the Towlers Bay mystery. There meeting us at the house on the front step, all alone, sat a very proper looking teapot. No note, no Christmas card, nothing to say to whom and from whom it came. We still don't know who gave us this very welcome gift. Our old teapot was/is very well worn and used. Mr G, who could enter - and win - an Olympic game version of crockery breaking, broke the lid for our old pot a couple of months ago and - being Scottish and frugal - was making do with a folded piece of tin foil for a top....he simply couldn't see the need to go out an buy another pot. A few friends had commented on the need for a new one but didn't say they were planning a surprise. If you are the thoughtful and wonderful friends responsible for the mysterious Teapot - THANK YOU! 2. Cuts. Mr G cut his finger in one of the boat cupboards as we were driving into Refuge Bay on the first leg of this adventure. Its enabled him to miss out on dish washing and other household tasks. BUT not on sailing and general boating stuff. It didn't need stitches but did require liquids - beer, wine, whiskey - to be administered on a regular basis. We are currently monitoring the situation. 3. There is a nice long beach called Hallets Beach in the National Park. We moored there one day and night. Molly was able to go ashore on one of the edges to swim and chase the frisbee and then when she was all done Mr G and I dropped her back at the boat and went to the big beach for a swim. It was pretty crowded on the beach with day trippers set up with eskys (ice chests for my international friends) and beach chairs. I looked over at the beach from the water and noticed something quite large moving amongst one of the picnics and called Mr G over. It turns out it was a very large goanna (BIG Aussie lizard for international friends) crawling all over these peoples stuff. It even crawled up on one of their chairs! Probably wanting a cold beer and some chips...it was a hot day. I asked the people nearest to us if it was on their picnic and it was...they freaked and ran up the beach clapping hands. The goanna very calmly swished up into the bushes. Unfortunately I didn't have the camera with me...but it was quite a sight. 4. Finally we had some visitors surprise us yesterday with an overnight visit. They were Kenny and his girlfriend. Kenny is from the Isle of Skye and came over 2 years ago with Mr G's young cousin John and another friend Ryan on a working visa. Their time is up and they are on their way back to Scotland via Thailand. That 2 years flew by. They were great to have on board...Molly LOVED their attention. 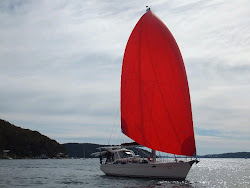 We went for a sail up through Broken Bay and out to sea in company with our friend John in his boat HAPPINESS. Below is picture of John under full sail from our boat. We dropped them off this morning .. they were driving back to Melbourne. We both certainly wish them the best and hope they make it back to Australia soon. PHEW...that's just a quick look at 5 days on the boat - busy, blissful, beautiful days - in a very short post. We had coffee on the waterside at this place almost every day...lovely. We're back up in Pittwater now. The food is running low - as is the drink - so it's time to go home tomorrow. Mr G and Molly are catching up on the nap they didn't get yesterday. Me, I'm enjoying getting back to blogging and catching up with emails. From my youth - A Friend Releases His New Book! Naked men; moving friends and more HEAT! Done, finished, thank goodness that's over with! Why don't most men listen? What a difference a day makes! and "Pi"